Are you looking to save money on your office equipment? Starting and running a business can be a big investment, especially in such a high dollar market at the Los Angeles area. When you are in the market for a quality copier and want to save some money, look no further than our local reps for used copiers for sale in Los Angeles. Our well-trained and friendly copiers sales and leasing representatives offer several different options of used copiers for sale in Los Angeles. Worried about buying a lemon? Never fear! We always refurbish our used copiers to factory standards. We always want to sell quality and will stand behind our products if they are in anyway faulty. You can be sure that we will never sell a used copier that has been overused or abused at its previous location. 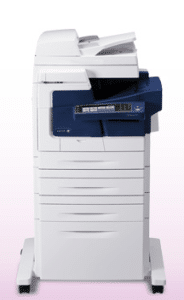 Our used copiers for sale in Los Angeles oftentimes are from copier leases and are sure to be well maintained machines with a limited print volume. We will never sell a machine that has had an incredibly high volume printing past because we don’t want the risk of a worn out machine. Not sure what type of used copier you would like to purchase? Let us help you navigate through the process, working to find the perfect fit for your business needs.